For nearly a decade, Shred Wise has worked with financial institutions, real estate companies, mortgage companies, accounting firms, CPAs, and bookkeepers to help them comply with today’s ever-expanding privacy laws. We offer them one-time and regularly scheduled document destruction services performed at their business site or at our facility in Orange. To meet their unique needs, our shredding services are fully customizable, competitively priced, and ensure that all sensitive information is disposed safely and securely. Because companies that provide financial products or services often produce large volumes of paper with protected information on an ongoing basis, these types of clients generally request ongoing, onsite shredding service. This service can be scheduled to occur at regular intervals, on either a weekly, biweekly, monthly, bimonthly or quarterly basis, and start as soon as you sign a simple service agreement. Our agreements outline the frequency of our visits, guarantee your rates for a year, and let you use our shred containers for free for the duration of our recurring service. To cancel service, our clients only need to give us 30 days’ advance notice. When we provide ongoing mobile shredding services in Orange County, one of our shredding professionals will arrive in uniform, place your documents and files into our 64 gallon rolling bins, and immediately shred them in our shred truck. By supplying you with free locking security bins and consoles, and by using a shred truck with a fully automated system to lift and dump each bin directly into the shredder, we minimize handling and keep your documents secure in between shredding appointments. Additionally, our clients are always welcome to witness the paper shredding process and will be issued a Certificate of Destruction at the completion of each job. For those who want their documents shredded off site, you can bring your documents directly to our facility in Orange, California, or schedule a time for us to pick up your documents in our secure panel truck and transport them to our facility for shredding. Call Shred Wise today to learn more. We’ll gladly provide you with a quote; answer any questions about your responsibilities with regard to current privacy laws; and help you determine the best shredding solution for your needs and budget. 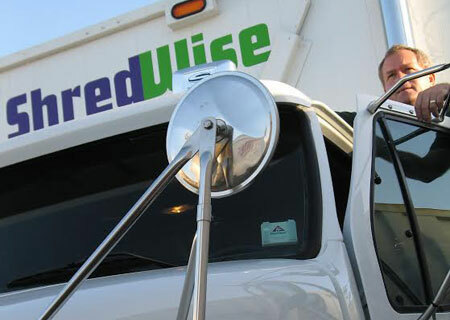 Shred Wise is licensed and insured, and a compliant with National Association for Information Destruction (NAID) standards.